The Association of Malayalam Movie Artists on Thursday united in solidarity with actor Dileep, who is being probed in connection with the actress assault case. Kochi: Ending speculations about a possible rift within the Malayalam film industry over the actress assault case, the Association of Malayalam Movie Artists (AMMA) on Thursday united in solidarity with actor Dileep, who is being probed in connection with the case. The apex body of Malayalam film artists, which met today in Kochi strongly condemned any attempts to isolate Dileep. Speaking after AMMA's general body meeting, its president actor Innocent who is also a member of the parliament (MP) told reporters that the Association's general body did not discuss the recent developments in the case as none of the members raised the issue. “The case is subjudice and there was no point in discussing the issue at the meeting. We believe that the police is heading in the right direction as far as the investigation is concerned. Let the inquiry report come. We do not want to make any public remarks on that matter. Even the Police chief has asked me to refrain from making any statements on the issue as it would affect the progress of the case,” Innocent said. He added that the Women in Cinema Collective (WCC), a recently formed body of women cine artists, had requested AMMA's support on many issues, including the safety of women working in the Malayalam film industry. "The General Body whole-heartedly decided to extend its support to the female actor's Association. Other than that WCC has not put forth any queries on the recent developments on actor abduction before the General Body,” said Innocent. 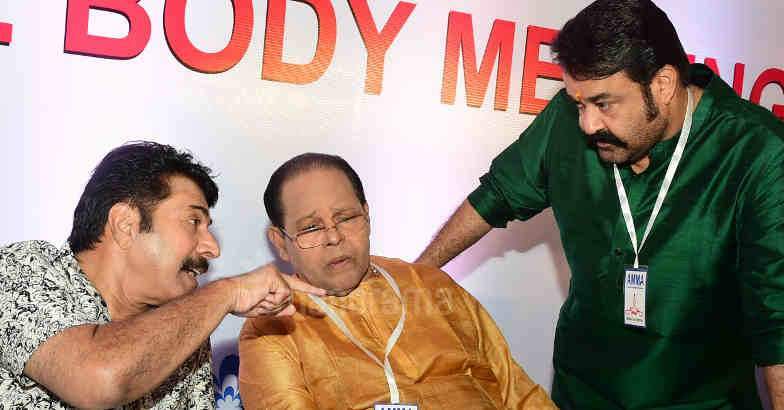 Meanwhile, the two stalwarts of Malayalam cinema, Mammootty and Mohanlal, who are also the general secretary and vice president of AMMA respectively, maintained silence throughout the press meet.